While the PlayStation 4’s Pre-Loading feature has gotten all of the press of late with Sony’s focus on offering plenty of games to pre-order on its PlayStation Store, it was something of a surprise that I discovered that the same thing is possible on the Vita now with the games in their PlayStation Store Play 2014 promotion. As you can see in the screenshot above, Rogue Legacy can now be downloaded right now in anticipation of its unlocking Monday night while also setting up automatic downloads of the other games so that they’re ready before they are unlocked for playing the night before. If you try to start up the game right now, it tells you that it’s too early and that you must wait for the game to be unlocked. They may not offer pre-ordering for Vita titles like on PS3 and PS4, but this is at least a start for the Cross Buy titles that are offered on those platforms. 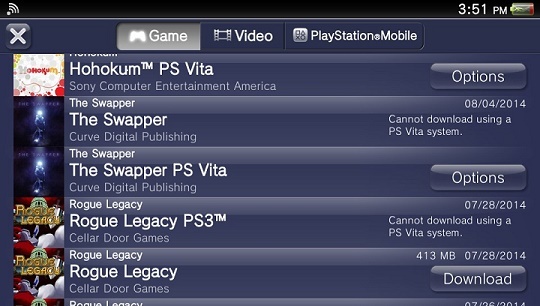 Editor’s Note: The same pre-loading options are also available for the PS3 versions of these games, so you just have to check your download list under Account Management to set-up the pre-downloading feature for those games and you’ll be set.